NAHB recently published the latest construction cost survey. Survey data show that while the average price of a single family home has dropped over the last two years, the share of that price which goes to construction cost and finished lot cost has not changed significantly. Although the share of the price going toward the cost of construction has remained stable over the last two years, the actual cost of constructing a new single-family home in 2011 is significantly less than in 2009. The average construction cost of homes in the new survey is $184,125, while the 2009 cost was $221,511. This is likely a result of the smaller square footage of homes built in 2011. The average finished area of a single-family home declined from 2,716 square feet in 2009 to 2,311 square feet in 2011. Divide the average cost by the average square footage, we see that the cost per square foot of constructing a home among surveyed NAHB members has remained around $80 per square foot for both 2009 and 2011. In addition to declines in the size of a home, profit accounted for an all-time low of just 6.8 percent of the final sales price in 2011. This is down from 8.9 percent in 2009. NAHB also asked survey participants to further breakdown the cost of constructing a new single-family home. As usual, framing and trusses accounted for the largest share of construction cost in 2011 homes (13.5 percent). This was followed by excavation, foundation and backfill (9.3 percent), plumbing (6.0 percent) and cabinets and countertops (5.6 percent). HVAC, siding, tiles and carpet, electrical wiring, and drywall each accounted for 4-5 percent of total construction costs. 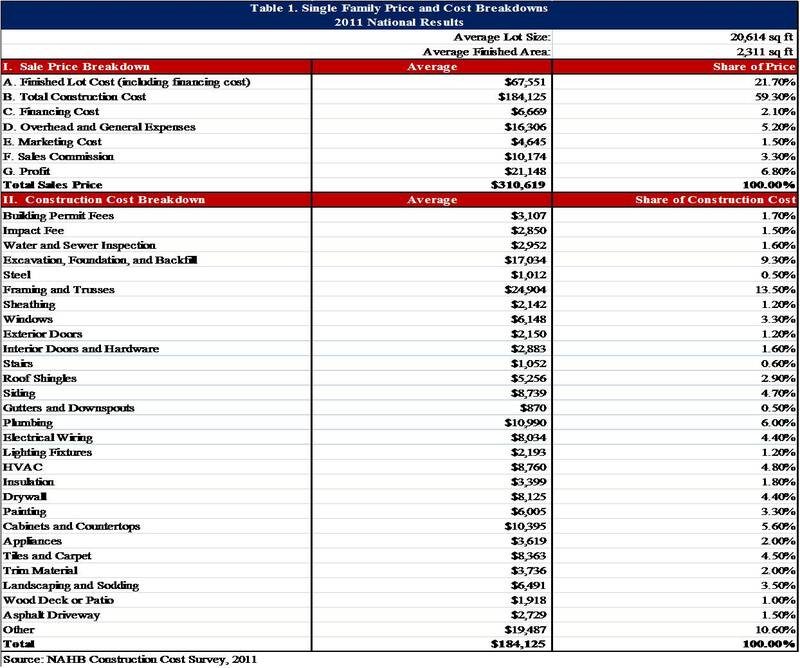 Below is a table detailing the single-family price and cost breakdown.